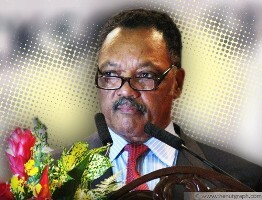 BEFORE President Barack Obama, there was presidential candidate Rev Jesse L Jackson, Sr. Although the Baptist minister had previously worked for Dr Martin Luther King, Jr, many were sceptical of his chances when he wanted to run for US president in 1984. Observers — including from his Democratic Party — thought he would garner fringe votes at best. But in the Democratic Party's primaries to select their presidential candidate, Jackson came out third in the run-off, and outlasted five more politically-experienced, white candidates. It is no surprise that Jackson was voted, in a 2006 poll, the US's most influential Black leader. But he has been nothing but controversial over the decades, whether as a politician or a civil rights leader. In fact, even as he endorsed Obama's presidential campaign, he was caught on camera saying that he wanted "to cut [Obama's] nuts off". Jackson has since apologised for the remark, and was seen shedding tears at Obama's victory rally. Jackson was recently in Malaysia on a speaking tour as part of the Bridges — Dialogues Towards a Culture of Peace program initiated by the International Peace Foundation. While the local press picked up on his glowing reviews of Malaysia, The Nut Graph decided to pick Jackson's brain on racism, affirmative action, and his principles as an activist in this exclusive interview. TNG: Your previous president was George W Bush, and then suddenly the US elected someone with a name like Barack Hussein Obama. What do you think the tipping point was, that Americans finally could elect someone who looked like Obama, and with that name? Reverend Jesse L Jackson Sr: Because America is maturing, becoming more secure, getting better because laws have changed, behaviour has changed, attitudes are changing. And it's not just in the political arena — more of us are going to school together than ever before. Barack went to Columbia and Harvard. More of us live next door to each other. More of us work together, more of us play together. More of us choose [to identify with] region, and it's not about race. So I see it as the maturing of America. Given your experiences in the civil rights movement, do you still think anything could have been done differently? Do you think anything more could have been done in the civil rights movement over the last four or five decades? Those actions made this action possible. I would say it's like President Obama ran the last lap in a 54-year race. All the things that preceded it made the outcome possible. And it took a lot of risky work to tear down the walls, the fears, to create the hopes. Speaking of turning over, I notice your positions have also changed. You were initially against abortion and now you're okay with it, and you were initially sceptical over gay rights but now you support them, and so on. Do you find yourself revising your positions a lot? See the grey hair on my head? (Laughs) You live long enough, and sometimes your positions change because conditions change. Your understanding changes. We should not take pride in never changing. Things that are growing [will] change. Sometimes for the better, sometimes for the worse, but [to] grow [you have to] change. You've talked about affirmative action, and the need to have inclusive action. Do you think there's a risk for some groups that if affirmative action goes on for too long, they might use it as a crutch or an excuse? You can measure quantitatively the need for affirmative action when you see evidence of negative action. Often those who are privileged [have their privileges] perpetuated by inheritance. [And some people] inherit poverty. So for example in America today, while we have grown an awful lot — blacks are number one in football, basketball, baseball, track, and tennis... [Blacks] are also number one in infant mortality. We've got one of the shortest life expectancies. We don't have access to capital, industry, and technology. So the evidence is that the needs should determine the programme. When there's no need for a programme you shouldn't have it. But need also determines how long the programme should last. And that's when you determine the cut-off, when the needs are finally met? Need is what makes it necessary, and need is what determines its duration. You see in baseball today, in football and basketball, there's no need for affirmative action because the playing field is equal, there's open competition, it's transparent — and so people accept the outcomes. But when the field is not even, and the rules are not clear, you need some plan. 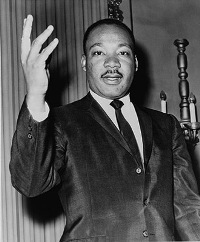 Is there one legacy from Dr Martin Luther King, Jr that you carry with you to this day? To build bridges, to make for the human family a place where we can share security. Initially, Shirin Ebadi, the Iranian Nobel peace prize winner, was invited to this series of talks in Malaysia that you are speaking at. But she ended up being uninvited, apparently because of certain pressure, either from Iran, or Malaysia, or both. There were a lot of criticisms that she is a Muslim feminist, and yet here you are — a religious leader talking about human rights and gender equality. Have you ever felt a conflict between your religious ministry and your human rights activism? No, my religion makes me affirm human rights. It's a religion of love, a religion of affirming the worth of every human person. And so, your religion should make you affirm human rights, not reject it. Religion says that we are all God's children, we are all worthy, and we should not be denied access to life's options. (Interruptions) I gotta go, buddy. There are a few lessons we can take from here. The reverend talks about a maturing America, one that more readily identifies with region rather than race. And he says, it is because today they are more likely to go to school together, to live next to each other and play together. Changes in laws and attitudes have played a role in this maturing of America from what it was over fifty years ago. In Malaysia, there is no law that prevents most of us from going to school together, living side by side with one another, and even basking together under the same glorious sun. But we do lack at least two things the Americans have strived hard for in their struggle to overcome the widespread acceptance and practice of racism; first they had to introduce changes to their laws and policies that broke down the institutions that practiced segregation and racist affiliations (something which NEP professed as a stated objective - to break the association of race and work sector) and secondly, they work hard for multi-culturalism to ensure that culture and language do not become barriers for minority groups. America is not perfect. But in the last fifty years, with people like the reverend, former presidents' Eisenhower, Bill Clinton, etc., the landscape of American society has changed. There is more recognition of minority rights and the protection for disadvantaged groups. There is also the explicit rejection of racism in government and other formal institutions. What can we say about Malaysia? Will courses on ethnic relations help resolve the division in our society? Don't we need to introduce laws and practices that shut out racism in our formal institutions? For example, we can have cultural or vernacular education as long as there is no restriction based on race. We should have long ago discarded institutions that only allow admission based on race. As I mentioned, we live, study and play together. We have had that for over the last fifty years. We are fortunate that our history is not one of subjugation among the populations in our society (although there are niche histories for the study of slavery in Malaysia - one example is the Orang Asli experiences and whose oral traditions talk of slave raidings; these community memories and experiences need to be addressed and researched). But finally, when America, and the world are moving towards recognizing diversity and credible democracies not only reflect the will of the majority, but strive to protect the interests and values of the minority within their midst, we have to ask ourselves why as a society, are we regressing. Today, there are other models to help developed marginalised members of our society. The idea of affirmative action can be beneficial but where it works to discriminate and keep people out because of race, this practice needs to be re-considered. Above all however, we need to strive back (and not forward) to a system that was more diverse in representation. Perhaps, changes in our attitudes and behaviour over the last fifty years, require us to introduce laws to make this happen. Perhaps, we need to think of anti-discrimination laws and make it a strict rule that as formal institutions (both in the private and public sector), we do not practice racism. I feel, to work towards the idea of Malaysia (one that accepts diversity rather than the reducing it to a single expression) we need to move beyond the assumption that we do not know each other. We need to do away with the structures that keep us apart. I have 2 comments - one on Jesse Jackson’s remarks on affirmative action; the other on his reflections on leadership and Obama’s election. Affirmative action is a system that seeks to address an imbalance or injustice in society. As in any system, its ability to successfully address the issue at hand is primarily dependent on a sound understanding of causal relationships between elements of that issue. Rev Jackson was asked about the risk of affirmative action going on for too long. In ‘systems analysis’ speak, this was essentially a question on how feedback loops work within the American affirmative action system. His answer - that affirmative action is necessary on the basis of need, is obviously correct… and his illustrations were clear - the sporting world in America requires no affirmative action because there is a level playing field in that area, whereas other indicators (infant mortality, access to capital, industry and technology) show that affirmative action is still necessary in other fields. However, his remarks pre-supposes that the most important question about Afro-American affirmative action was answered correctly in the first place. That question is: Is the observed economic disparity between ‘white’ and ‘black’ America a result of discrimination on the basis of skin colour or race? The answer in this case is obviously YES - racial discrimination coming as it does from America’s legacy of slavery and the prevalent attitude of white supremacy which gave rise to it. While feedback loops and indicators need to be continually monitored so that adjustments in the system can be made, Afro-American affirmative action policy is on a firm footing with regard to causality. Another obvious example would be the case of affirmative action for women. Question: Is the observed economic disparity between men and women a result of discrimination on the basis of gender? Answer: YES - largely a result of the legacy of patriarchy and attitudes surrounding the ‘right place’ of women in society. Affirmative action in Malaysia, however, does not enjoy similar foundations. If, what I would call a first-order question, is asked: Was the economic disparity between the races observed at the beginning of this nation’s history a result of racial discrimination of one form or other?... the answer would be NO. The primary causal factor for this disparity was not racial but locative. The vast majority of the Malay population was located in rural areas while the vast majority of the Chinese population was located in urban areas, with all the attendant economic advantages that comes with urban living. This was due to the fact that most immigrant populations are naturally drawn to urban areas, and exacerbated by the Briggs plan which involved the resettlement of Chinese populations away from rural areas by the British during the Malayan Emergency. Any constructive thinking or discussion on the NEP, which I assume partly lay behind the Nut Graph’s question to Rev Jackson, would, in my opinion, need to take causal factors and relationships much more into consideration, rather than just assuming them as a given. It is one thing to observe economic disparity between the races, it is quite another to formulate policy that addresses the data effectively. Neither should evidence that the NEP has indeed bettered the economic standing of many in the Malay Malaysian population be proffered to legitimise the policy. Let me illustrate this with a medical analogy: a patient with an infection goes to see a doctor with poor diagnostic skills. The doctor gives the patient a cocktail of antibiotics designed to get rid of as many bugs as possible. Claims by the doctor that he has cured the patient does nothing to hide the fact that this is bad medical practice. The patient, though cured of his or her presenting infection, has to pay the price of the many side effects of antibiotic abuse. In the same way, affirmative action policy when not aligned correctly with causal factors may indeed ‘work’, but the price of denying a vast section of the population meritocracy, is a high one. Rev Jackson pointed out that President Obama ‘ran the last lap in a 54-year race’ - referring to the maturing of American society won by the long civil rights movement. While this is undoubtedly true, and good though it is seeing a black man in the White House, President Obama’s victory in the last election was much more than just the culmination of the civil rights movement. When Jackson ran in the democratic primaries in 1984, he was perceived as the leading black leader at the time. Although he did better than expected, running on a race ticket is, nonetheless, a numbers game - one which, in the end, went against him. 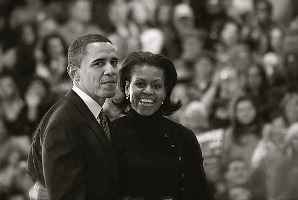 What made Obama so different was, not only did he run as an American citizen who ‘happened to be black’, he ran as a citizen of the world - one who had a good grasp of the values and challenges we all have in common. He successfully negotiated the ‘is he too black or not black enough’ questions by making us believe that what makes us the same is far more important than the things that make us different. As such, he inspired everyone - young and old, across the political spectrum, all colours, creeds and walks of life, not just in America but throughout the world. While we wait to see how he handles the worst in-box inherited by any President, it is worth reflecting on the fact that the reverse must also be true. That is, no aspiring leader can hope to inspire and galvanise people (the rakyat) running on a race ticket. The world has changed, and it is changing exponentially. Although uni-racial political parties are very much part of this country’s history, it surely must increasingly be less of the country’s future. The numbers game may well be pragmatic, but the inspiration that we long for comes from another place entirely. Great article, Shanon! More leaders should be like the reverend, and the world would be a much better place. Enjoyed reading Kamal's comments too. Keep up the good work, Nut Graph!